This year, our community voted to read “Killers of the Flower Moon: The Osage Murders the the Birth of the FBI” by David Grann for this year’s One Read program. Over the last 17 years, several nonfiction titles have been selected, but this is the first time that a true crime story has been chosen. The community is given the summer to read the book in preparation for related programming, including an author talk, in September. David Grann’s dogged research and spellbinding storytelling combine to create a riveting true-crime narrative. He starts at the beginning when white settlers pushed the Osage Nation into Oklahoma in the 1800s. Fortunately, the tribe retained the mineral rights to the infertile land they were forced to call home. The subsequent discovery of oil made the Osage rich, and the U.S. government appointed white “guardians” to help manage their wealth. In the early 1920s, a number of Osage Indians suddenly died under mysterious circumstances or were outright murdered. This campaign of terror spurred young J. Edgar Hoover and his newly established FBI to investigate, ultimately uncovering shocking depths of greed, bigotry and corruption. 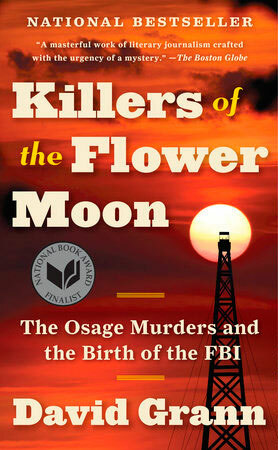 “Killers of the Flower Moon” was a New York Times bestseller and a National Book Award finalist. It was also named the best book of the year by the Wall Street Journal, GQ, Time, Newsday, Entertainment Weekly, NPR’s Maureen Corrigan, NPR’s “On Point,” Vogue.com, Smithsonian, Cosmopolitan, Bloomberg, Library Journal and others. David Grann is a staff writer at the New Yorker and the bestselling author of “The Devil and Sherlock Holmes” and “The Lost City of Z,” which has been translated into more than 20 languages. His stories have appeared in many anthologies of the best American writing, and he has written for the New York Times Magazine, The Atlantic, The Washington Post, The Wall Street Journal and The New Republic. He will be in Columbia on September 25 for the One Read author talk at Columbia College’s Launer Auditorium. “It’s really a testament to our community of readers that engagement in One Read remains high in its 17th year,” said Kat Stone Underwood, One Read co-chair. “Last November, we received 140 suggestions for what to read in 2018 and this April 594 people voted for which book they wanted to read.” The One Read reading panel, made up of community members from Boone and Callaway Counties and library staff, narrow the list of suggested books to 10. After reading each book, the committee selects two titles for the public to vote on in April. The other title considered this year was the historical fiction novel “News of the World” by Paulette Jiles. As in past years, the Friends of the Columbia Public Library will fund the purchase of multiple copies of the One Read title for people to check out so anyone wanting to read it will be able to before next September. It’s also available in large print, on CD, as an eBook and downloadable audiobook..
One Read, now in its seventeenth year, is a community-wide reading program coordinated by Daniel Boone Regional Library and co-sponsored by a task force of local businesses, agencies, academic institutions and other groups that encourages adults of all ages to read and discuss a single book. More information about submitted titles and related One Read topics can be found at www.oneread.dbrl.org.